Vegetable upma with tamarind chutney and cilantro cashew chutney. My upma is spiked with brown mustard seeds, curry leaves, bird's eye chiles, tumeric, ginger and garlic. 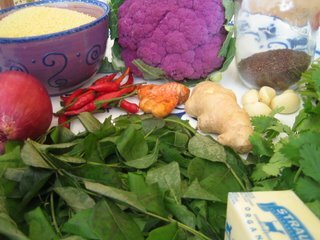 Do not attempt to adjust your monitor, that is not orange ginger below, it is fresh tumeric and behind the tumeric is cauliflower that is actually purple, just like the faces of the umpa lumpas from Willy Wonka's chocolate factory. 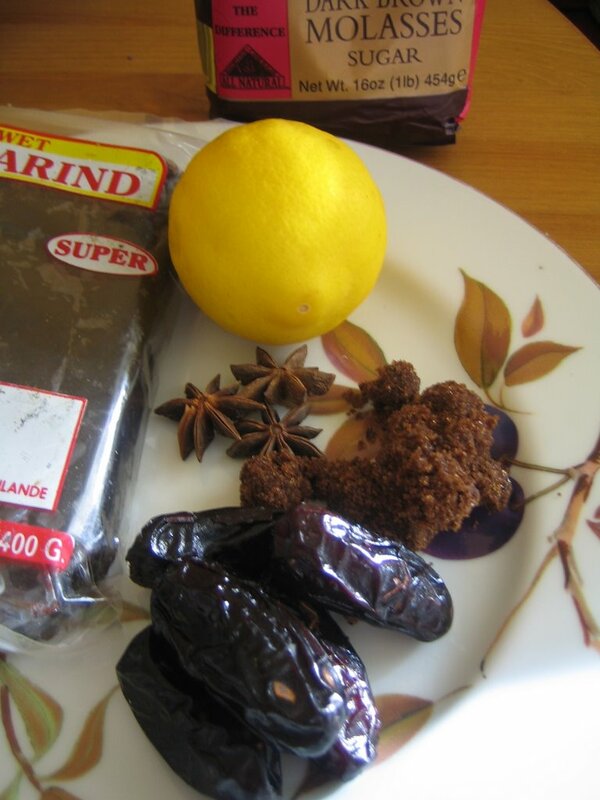 The glossy black pool in the bottom right of the bowl of upma is the tamarind date chutney, infused with star anise (ingredients for tamarind chutney in photo to the left). 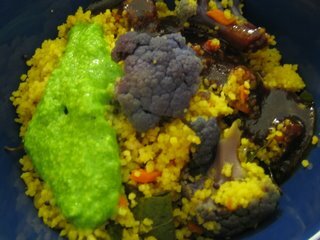 The fluorescent green sitting on the upma above is cilantro cashew chutney not piccalilli or Chicago style flourescent green hot dog relish. The leaves in the front are curry leaves, which, ironically, are not always found in curry powder. The jar in the back contains brown mustard seeds, and the bowl is filled with cous cous. I don't know why the linguistic police make us say it twice, but it is worth saying two times to show respect for the effort put into the process of rolling cous cous. One of the members of the tooth decay posse, Chef Rita Flores (in photo on right with Desi) makes cous cous taste so good that you want to say it three times, cous cous cous. Upma is traditionally made with suji which is broken rava (duram) wheat, but I have made my upma with cous cous, a common substitute for suji. This makes sense since cous cous is made from duram wheat and rolled into pieces about the same size as suji. 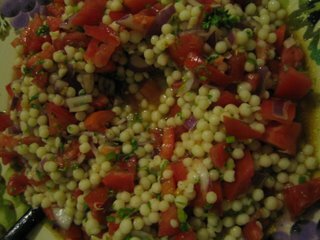 The larger cous cous known as Israeli cous cous and maftoul makes for a wonderful salad with tomatoes, olive oil, lemon juice, parsley, and red onions. Just cook the maftoul like pasta, toss with all the ingredients and serve at room temperature. 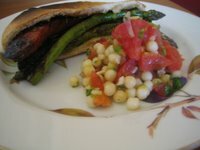 Add radishes for a cool kick, watermelon radishes if you can find them at your farmers market. I like to make this maftoul salad to accompany sandwiches like this grilled lamb sausage and asparagus pita sandwich. It goes great with cucumber raita too. Here is another great way to prepare cous cous. Rava (Indian semolina) and cous cous are great for making deserts also. I have even made desserts from Israeli cous cous. I have used it like rice in rice pudding. 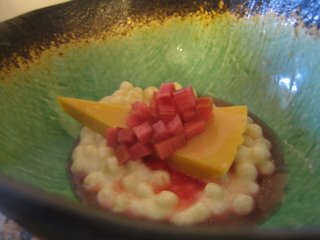 Kaffir lime maftoul (Israeli cous cous) pudding with gingered rhubarb. Vanilla maftoul pudding with tropical fruit. Orange maftoul fritters with dark chocolate fondue. 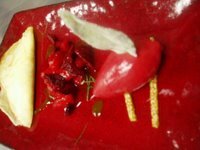 Another cous cous dessert, left, was Maftoul crepes with strawberry sorbet, sesame croquant, basil, and strawberry compote. The texture of the Maftoul goes well with the crunchy croquant and smooth sorbet. This is a cous cous version of falooda. Saffron kulfi sits on coconut Israeli cous cous and is topped with rose rhubarb water. Looks like something you'd find at Willy Wonka's chocolate factory. Does Willy Wonka produce organic chocolate? These chocoletiers do. Rani- sugar, smooth, thumbs down. Raja- corn, corn syrup. Unpleasant texture, blueberry start, unripe persimmon/ raw quince finish. thumbs down. Rani- a little sweet, smokey, thumbs up! Raja- earl grey tea, musky, tangy, cranberry, a little sweet, thumbs up! Raja- Buttery consistency, coffee, devil food cake, slightly fruity like dried cranberry, little sweet, potent, thumbs up! Raja says- fruity, raspberry, hibiscus, a little soft, a little sweet, thumbs up! We did two separate blind tastings. We ould not pick up a strong scent from any of these chocolates. We both gave two thumbs up to Green and Black 70%. I also liked the Valrhona and the Terra Nostra. I did not like the Sweet Earth chocolate, it reminded me of Christmas mulled wine punch. Neither of us liked the Dagoba chocolate. Unfortunately we prefer our favorite non organic chocolates to these organic chocolates. 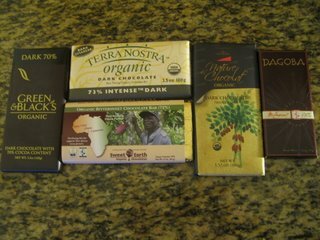 Chocolate makers do not have as many options when producing organic chocolate because there are not a lot of organic growers. Non-organic chocolate makers have more variety in beans for blending, and the best varieties are not grown organically. But some of the organic chocolates are still quite good. Do a tasting and let us know what you think. Have we not tasted a favorite organic chocolate of yours?